Bethlehem University welcomed a Chilean professional women delegation to campus on Tuesday, 3 July 2018. The delegation was welcomed by Brother Peter Bray, Vice Chancellor, Brother Denis Loft, Vice President for Advancement and Ms. Amjaad Musleh, Guest Relations Officer. The delegation was accompanied by Mr. Salim Hodali (BU'05), Manager of the Representative Office of Bank of Palestine in Chile. Brother Peter told the delegation that Bethlehem University provides quality education to its students in a safe, caring and predictable environment despite of the ongoing difficulties. He added that one of the greatest challenges is to keep hope alive and such visits support the university to continue being the oasis of peace. 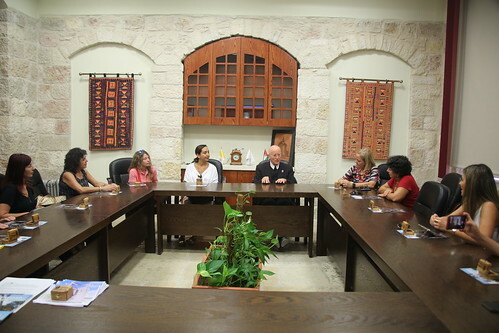 Two Bethlehem University students from the Student Ambassador Program met with the delegation and shared their experiences as Palestinians and students at Bethlehem University with special focus on the daily challenges of students. The delegation was briefed on the Development Plans of Bethlehem University during the meeting which was followed by a tour of campus.